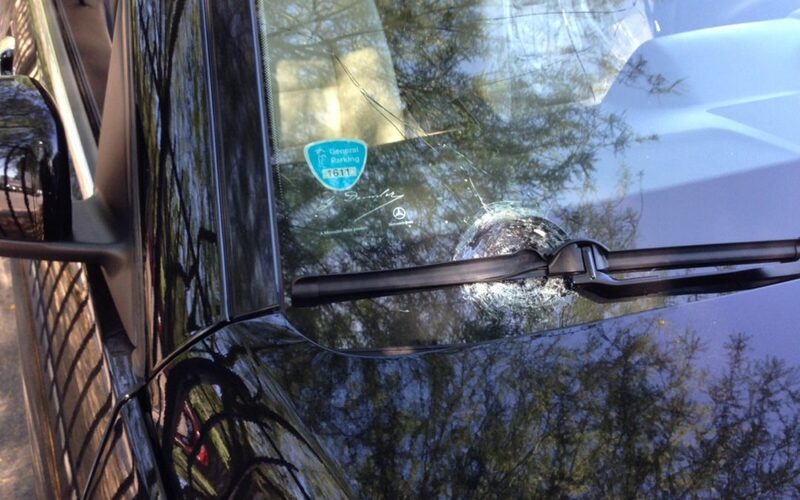 Cracked Windshield – Was It A Bullet Or A Rock? Everyone who has driven for any period of time, especially on highways with its share of construction vehicles, eventually gets a rock or debris thrown at their car by the vehicle in front. In many cases, that small stone would otherwise be no issue, harmlessly bouncing off and disappearing behind the rear view mirror. However, when the small bit of gravel travels at just the right trajectory it can result in a cracked windshield hitting it with the power of a bullet. The fact is, a car on a road or highway is moving anywhere from 30 mph to 70 mph at any given time. The stone may typically be launched into the air in the opposite direction from underneath a tire or off the back of a construction truck bin. While the stone itself may only be moving a scant 2 mph or slightly more in real time, it’s going in the wrong direction. When the car surface hits the stone in the air, it’s as if the stone itself was thrown at the windshield at just about the same speed the car is driving. Basic physics takes over: the velocity of movement times the mass of the stone creates an impact similar to a high-speed projectile. Occasionally there are those rare occurrences when something a little bigger than a rock or pebble comes flying at your windshield like the car in this video! What’s more amazing is the fact that car windshields can take a highway speed rock impact and generally stay intact. The laminated glass involved is so strong, it doesn’t shatter right away but instead retains it’s safety feature while still providing a transparent, see-through barrier. However, once a chip or crack occurs, that strength has been weakened. If the chip is not sealed, it will turn into a spreading crack. Once a crack develops, it is just a matter of time before the windshield will fail structurally, unless you consider windshield repair or replacement. In Arizona drivers needing Phoenix windshield repair can make their cars safe again with the expert help and professional service of Blue Chip Glass. The company deals with all types of cars and trucks, providing quality auto glass repair for small and big jobs, regardless of vehicle type. Not only can small chips be sealed quickly and windshields replaced, the company follows and uses all the standard industry protocols for bonding a new windshield to a car, making sure it stays in place and performs as expected. Blue Chip Glass is the way to go for a safe return to the road and a crystal clear windshield.